Every small cupboard shop that makes kitchens and bathrooms can build the boxes, then order raised panel-vinyl clad doors to fit the cases. Most mass production faculties will allow custom sizes to be ordered. 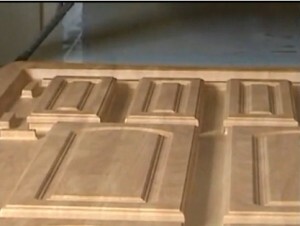 Most companies offer the doors in two final finishes, high-gloss and matte finish. Gloss doors are outrageously expensive in comparison the duller coating. Frames for glass inserts and mullion designs are standard selections that are available. Crown molding, light-valance rail and other decorative moldings are always optional items that can be ordered as well. The normal lead time is about two weeks from the time the order is placed until it ships from the Thermofoil plant. Most shops that are making kitchen and bathroom cupboards will allow six weeks from the time the drawings are approved by the customer-to the final install of the Thermofoil kitchen, office, laundry room, or bathroom cabinets is complete. 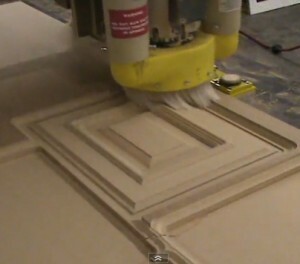 They call them CNC routers or cabinet door making machines. These computer driven, automated systems can cost from fifty thousand ( $50,000) to well over one hundred thousand dollars ($100,000). The board that is used has one side raw and the other side already has a flat, hard-shell melamine finish on it. The door size and design information is entered into the computer. Thermofoil kitchen cabinet doors are made throughout the world. There are many manufacturing plants in the United States. Since the initial release of these vinyl wrapped doors, how they are made has improved tremendously. 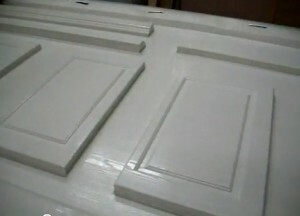 Years ago, there were vinyl glue problems that caused the doors to be defective after a couple of years. 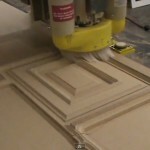 Advancement in how the MDF doors are made has almost eliminated delaminating issues altogether. Now most of the doors that get damaged are caused by negligent homeowners who allow the doors to be exposed to too much heat. very good job i really impress by the use of machine for kitchen units doors . 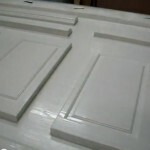 Where can you get PVC doors repaired!! I have some that are bubbled!